Have you just purchased a fused deposit modeling 3D printer (FDM/ FFF)? Not sure what accessories are essential for maintenance? Our FDM accessory toolkit lists vital tools any consumer 3D Printer owner must possess to obtain best 3D build results. Refer to this 3D Printing Essentials Guide for all your 3D printing needs. Certain 3D printers require additional upgrades for best 3D print functionality. Below lists a few 3D printer specs and the upgrades recommended to improve performance and 3D print lifespan of the particular 3D printer company brand and model. The Ultimaker is truly a no-hassle 3D printing experience compared to other 3D printer machines we've tested. It's extremely reliable and very well designed. The design of the feeder tube has been the main flaw of our Ultimaker 2Go. After a short period of time, grinding issues occur that effect the filament bowden tube insertion and feeder design mechanism. Essentially, the insertion point of the filament tube has become either too narrow or the filament consistency too thick which causes the filament to clog between the gears. The filament clogs at the mouth of the bowden tube and horse-shoe fitting. Unloading is required. To fix this design flaw, there are hacks available to 3D print a new feeder design. 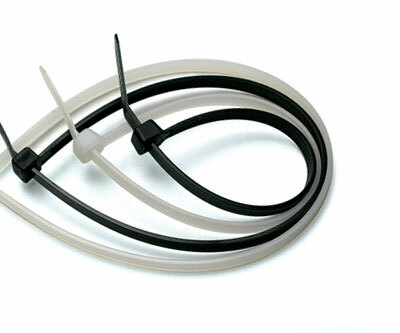 A wider diameter bowden tube replacement may additionally reduce some of the resistance to the feeder mechanism. If you don't want to spend $8 for a replacement tube, simply snip off no more than .25" at the bowden tube end and manually widen the diameter the tube with some long needle nose pliers. Shoot us an email if you'd like us to upload a video of our 5 minute quickfix for this error. Filament To Use: Only Ultimaker and ColorFabb filaments for us. Some use glue sticks, but we prefer blue tape. Applying tape to the 3D print bed is essential for obtaining quality results and protecting the build plate from damage. Scratches may create concerns related to proper leveling, printing without rafts and 3D print issues. Blue painter's tape is the most commonly used masking tape for 3D printing with PLA filament. It's durable, inexpensive and effective for non-heated beds. Applying wider tape (typically more costly) requires less surface coverage for your print bed, but in reality, any dimensional tape thickness will be suitable as long as the bed is fully covered with strips of the tape. Please do not purchase just ANY brand of masking tape. Strong tape adhesion is mandatory for long print times. Cheaper brands often produce poorer quality prints, and over long periods of print time, these 3D prints will be more susceptible to warping at the base. Using glue sticks or hair spray may offer additional build plate adhesion for pla filament. What We Recommend: 3M's Scotch-Blue 2090 tape. 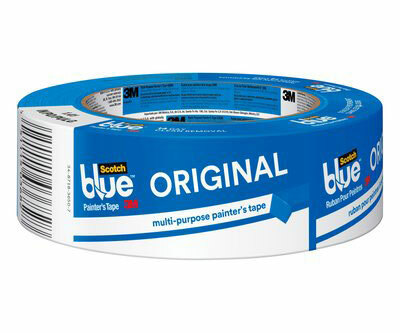 We find blue 3M Scotch-Blue 2090 painter's tape a superior choice more conducive for longer print times and multiple object prints. 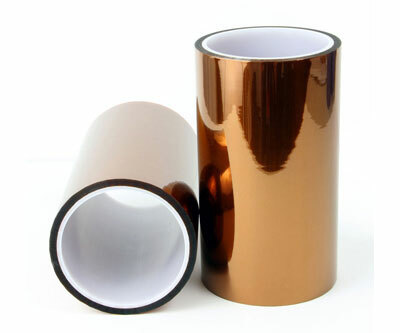 Visually identified by its translucent gold film, Kapton tape provides high temperature adhesion excellent for ABS filament and heated build plates. Make sure your bed surface is clean before applying the film. Any spec of dust or dirt can create bubbles on the film's surface. The bubbles can leave marks along the base of a 3D printed object when printing without raft. Applying the tape with a wallpaper squeegee or credit card can help reduce bubbles of the film. A 3D print removal spatula is essential for an FDM/FFF 3D Printer. It's thin, strong and flexible enough to pry off 3D prints from the print bed. 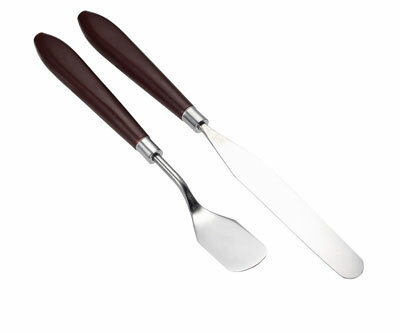 Typically, the leading edge of the tool is tapered. The narrow blade is very useful for removing stubborn parts constructed with raft. This pliable blade allows for easy removal without damaging the print bed. If you require larger areas prints, consider purchasing a longer flexible blade to best reach underneath wide prints. 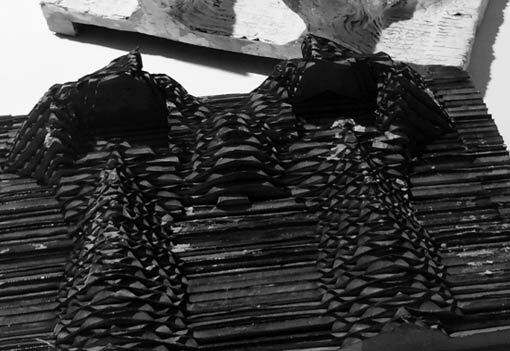 Over time, you may required a variety of tools - different spatula, shovel and palette knife sizes - depending on the 3D print size and print details. What We Recommend: Foreasy 3D Printer tool enhanced version. Good overall starter set for the value. Bed Leveling tools should not be overlooked when developing a 3D printing toolkit. Proper leveling is essential to reduce 3d print warping and curling at the base. 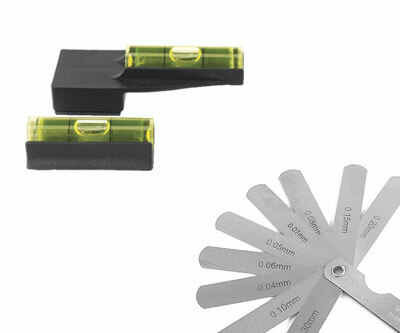 To check alignment or troubleshoot operations, a simple bubble level and feeler gauge may prove quite useful. One of the most basic tools for any kit: a good pair of scissors. 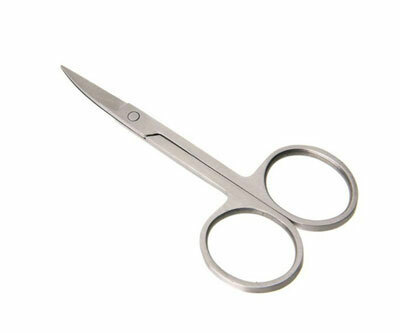 We recommend purchasing a small pair of non-curved stainless steel facial scissors typically used for trimming hair. These scissors are fairly sharp and easier to reach small 3D print crevasses and help remove ultra fine 3D print supports. 3D printing involves metric applications. 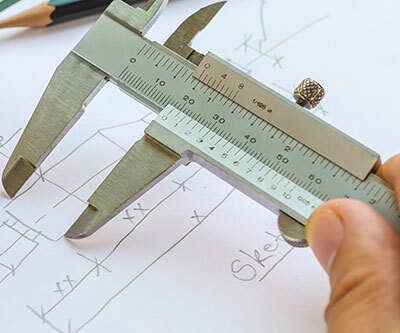 Since we're located in the United States, a small pocket metric ruler is particularly helpful for calculating equivalents between metric and imperial systems. A digital caliper may also be needed for dimension standards and checking the accuracy of the print measurements for technical precision. Have a compressed air duster can lying around near your computer? When you take apart your feeder or extruder due to filament blockage, don't forget to clean away dirt and filament particles with a can of compressed air. The air duster will safely blast away any unwanted micro-particles and reduce further particle impediments. A compressed air duster is 100% ozone safe and containers no Chlorofluorocarbons (CFCs). Due to the extreme temperatures present around the hotend, it is best to avoid touching the nozzle directly with your fingers. A wire brush, pair of needle-nose pliers (and to some extent tweezers), and acetone will do wonders for that glob of filament goop plastered to the end of the extruder nozzle. Simply scrub away any excess filament from the hotend using tweezers and a wire brush. 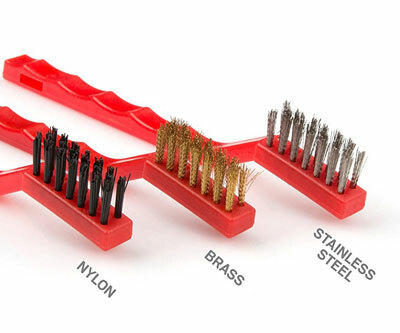 Remember to choose a wire brush with appropriate metal bristles to accomodate your 3D printer's nozzle material. Nozzle Cleaning Tips for Filament Blockage:If you find hard-to-reach areas of blockage that impede filament extrusion, remove the nozzle from the extruder using a socket wrench or similar device. Place the nozzle in a glass jar of acetone or nail polish remover. Soak the removed nozzle in the bath for 15 minutes to clean away any dirt particles. Re-clean the nozzle again with a wire brush. If all else fails, use a butane torch (like a Bernzomatic micro pencil butane torch) to heat the nozzle for about 1-2 minutes. Hold the nozzle in one hand with pliers, and torch the nozzle with the other hand. Make sure to wear gloves! If you don't want to perform these additional measures, just purchase a new nozzle and skip this nozzle cleaning stage. 3D Printing involves many moving complex machine components. Fasteners are bound to become loose over time. Screwdrivers, hex drivers or torx star keys are critical for removal. A socket wrench and adjustable wrench are particularly useful for maintenance. A socket wrench provides the much needed control to fine tune and tighten fasteners. It's also very handy for deploying extruder nozzles securely without damaging the hotend assemblies. When facing difficulty removing parts, holding objects together with an adjustable wrench may provide a beneficial grip for maneuvering. Custom machine parts often require either a hex key or star key to fit into the shaped slots, while more common parts involve using a philips or flathead screwdriver. 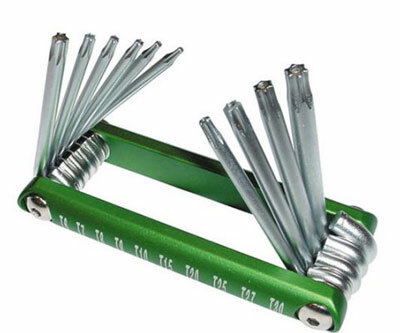 Review your machine's specs before purchasing a hex key or star key set. Most brands don't employ both fastener types. Depending on the 3D printer brand you own, purchasing a mini screwdriver set may also be beneficial for ease of adjustability. Fine-tune your 3D printer with annual maintenance. It's very important to lubricate the axles once in a while to keep the 3D Printer running smoothly and properly. Makerbot recommends lubricating the z axis threaded rod and the x axis idler pulley every 50 hours of build time using white lithium PTFE grease. Ultimaker advises lubricating the x and y axles with sewing machine oil when you detect small ridges on 3D printed surfaces. The Ultimaker website clearly states, "Don't use WD40 as this will affect the coating that is on the axles". 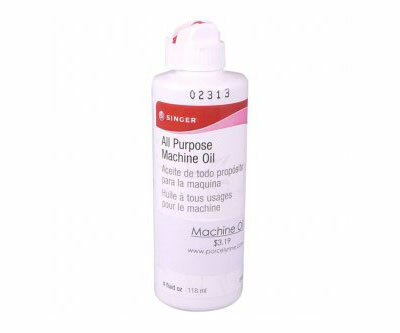 What We Recommend: Singer All-Purpose Machine Oil. It's an ideal choice specifically formulated for lubricating sewing/knitting machines, vacuum cleaners, computer hubs and many other devices. If you own a similar 3D printer brand to Makerbot, use our recommended brand of SuperLube white lithium PTFE grease. 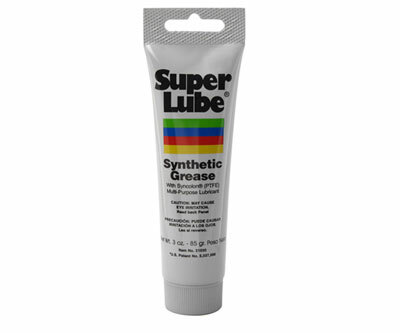 SuperLube grease is compatible with ABS and PLA. NOTE: We always wear disposable gloves for cleaning purposes. For either lubrication option (Singer or SuperLube), please do not drench the part. A small amount of lubrication will suffice. Many 3D printers rely on cable ties / zip ties to maintain organization and reduce the moveability of cable bundles. Depending on your 3D printer and its reliability, it's always smart to keep a few spare cable ties in your toolkit arsenal for a rainy day of unexpected printer errors. If you regularly change filament types or use hard composite filaments like stainless steel, having a few spare nozzles will always come in handy. Typically the pre-installed nozzles are of brass material, but purchasing an upgrade - like a plated brass, ruby tipped nozzle or even a stainless steel nozzle - can provide better wear resistance and thermal conductivity against abrasion and hard composites. 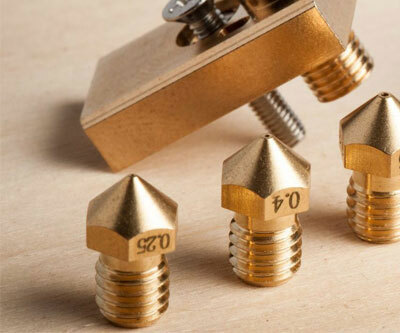 Recommended nozzle brands to use with metal composite filaments: Proto-Pasta, E3D and 3DVerkstan. Read about the Olsson Block tool (featured on Ultimaker) for ease switching between nozzles and nozzle sizes. Before painting your 3D print, don't forget to fill and sand it! 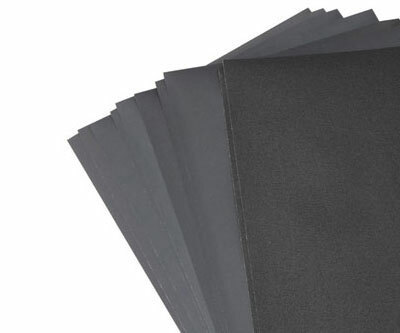 We recommend purchasing a variety of assorted sandpaper grit sheets for fine-tune detailing. Finishing gives an added degree of smoother precision and can significantly reduce the appearance of 3D print layers on your part. Always wear a mask when sanding and using sandable spray filler/primer. NOTE: Sandpaper finishing is required when printing with wood composite filament. Did you know that filament retains moisture from the exposure to air? The culprit’s called humidity and thermoplastics love to absorb it. Too humid filament is often brittle – not pliable – and snaps when twisted. To avoid surface imperfections, filament should ideally be stored in a vacuum-sealed bag with a humidity absorbent desiccant. 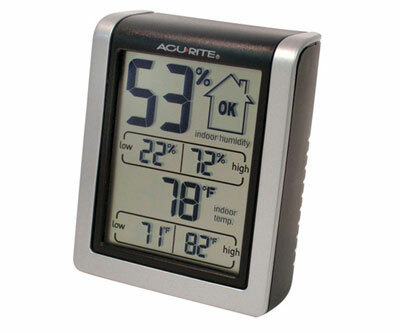 Purchasing a digital hydrometer, such as the AcuRite Indoor Humidity Monitor, is always an important accessory to any 3D printer toolbox. It's great for analyzing your moisture exposure in your 3D printer room. Instead of storing your filament in vacuum sealed bags, you can opt for a more affordable maintenance storage: keep your filament sealed in zipped storage bags (obtained from your local grocery store or convenience store) with a couple of silica desiccant gel per bag. A lot of our 3D workshop attendees want to purchase their own FDM/FFF 3D Printers but are unsure what accessories are needed for maintenance. We hate seeing 3D Printers used as paper weights. Please refer to this 3D Printing Essentials Guide for best maintenance and longevity for all your printing needs.